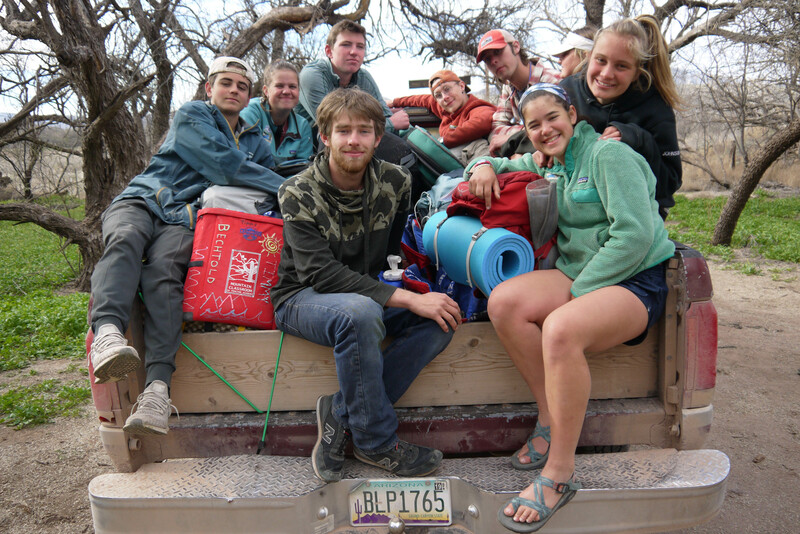 Proctor Academy's winter Mountain Classroom group surpassed the midway point in their journey west. 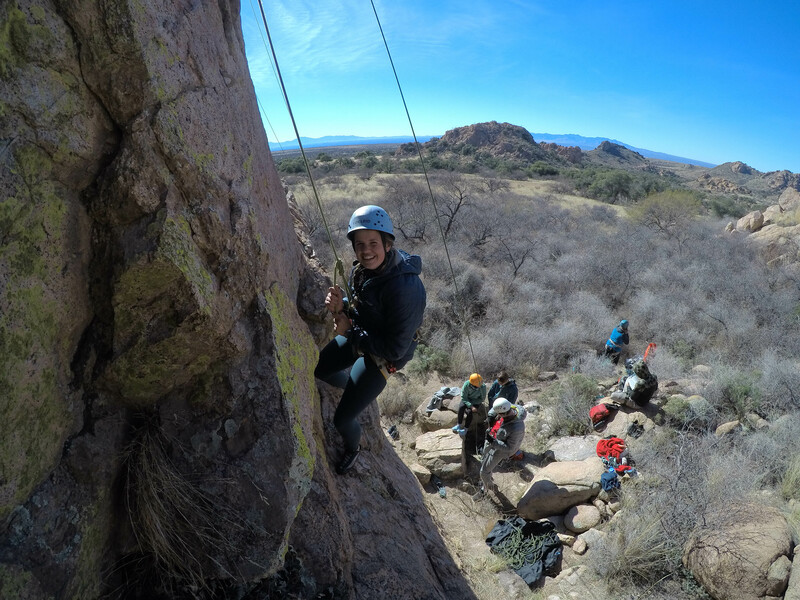 After a week of climbing at the Cochise Stronghold and spending time with adjunct instructor Chris Farrell (former Mountain Classroom instructor) and program director Patty Pond, the group is ready to head off on their next adventure. 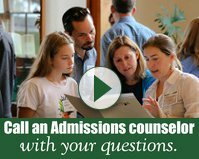 Read reflections from Marshall '19 and Drake '20 in this week's blog post below! Staring up the face of a cliff, the only thought in my head is, "How am I going to climb this thing?" It’s 50 feet tall and practically flat. What little hand holds there are can only be held by the tips of my fingers and foot holds require my feet to be 90 degrees to the side to even have a chance to stand. Definitely a 5.10 climb, 5 meaning that it requires ropes to climb and .10 meaning that its, in one word, hard. 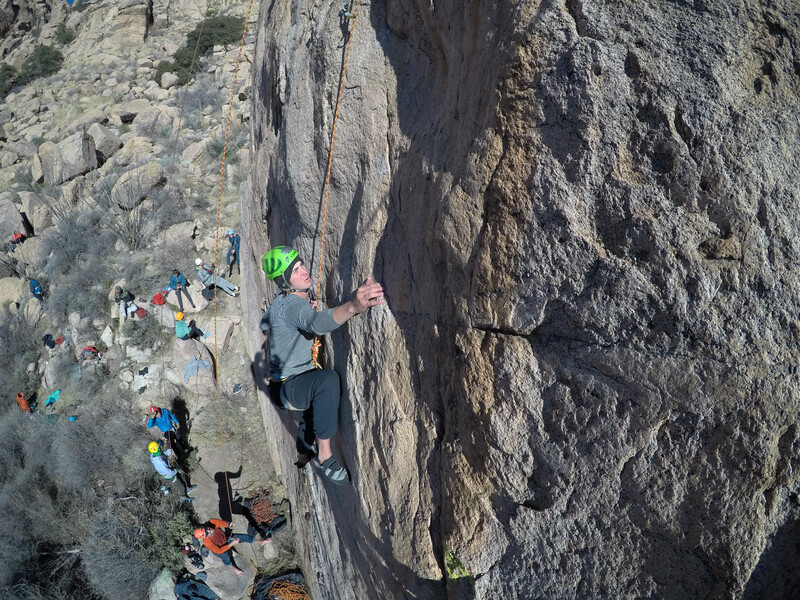 This is a normal climb in Cochise Stronghold, a three day activity and the first in which we were joined by the wonderful Patty Pond form Proctor’s main campus. We arrived late at night after a long car ride from El Paso. People scrambled to set up tents in the dark while Quinn and I decided to sleep out. The next morning we awoke to something I had not expected, frost in the desert. Unfortunately, I did not have a tarp over my head so my entire sleeping bag was covered in frost. Undeterred, we quickly had breakfast and met our wonderful climbing guide Aaron. We spent the first half of the day climbing up a virtually flat but not completely vertical wall that we all managed to climb in the end. However, most of us waited a bit for the sun to come around the corner to warm up the wall. We belayed each other which was new for a number of us. The next half of the day was spent at the wall right next to our campsite. After we climbed our fill we were given free time to do work and rest after climbing. After dinner we played a fun round of ‘Chubby Bunny’, marshmallow eating game where you put a marshmallow in your mouth and say chubby bunny. Unfortunately the marshmallows that we used were jumbo sized and few in the group could fit even one in our mouths. We finished the day excited for the next, although I greeted the day before most of the group because of a furry little friend jumping on my legs at 2:00 in the morning. When the sun finally rose, Aaron met us again and we set off to the next wall. We stayed at this wall all day. It was taller than the first wall we climbed, yet just as flat. There were a ton of large rocks right next to it that a lot of us climbed around on while waiting again for the sun to warm the rock. We really came together in supporting each other through encouraging comments and belaying each other. 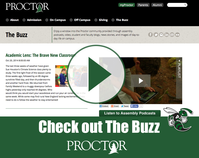 As we returned from camp and said goodby to Aaron, we relaxed and worked on homework. I decided to set up a tent after meeting Mr. Fuzzy the previous night, who according to Quinn might have been a ring tailed cat. The next day we prepared to say goodby to the Stronghold. 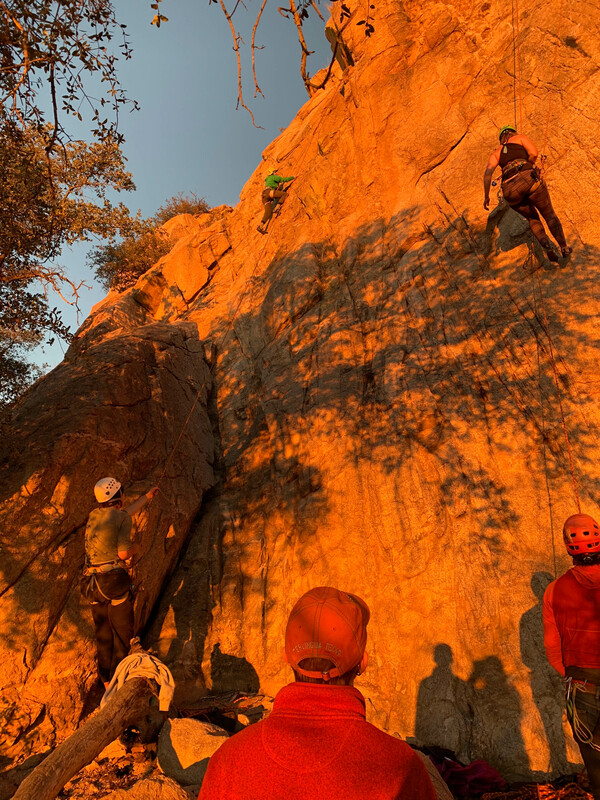 Some of us got in some last minute climbing on the cliff by the camp site in the mourning. 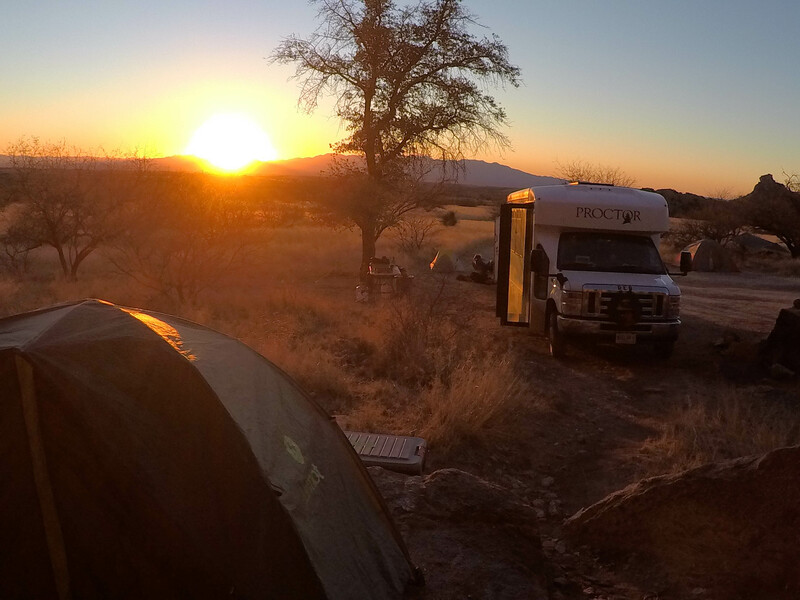 Afterwards we packed up everything and said goodby to Cochise Stronghold. Although it was a short couple of days, it had the impact of a full week of camping. 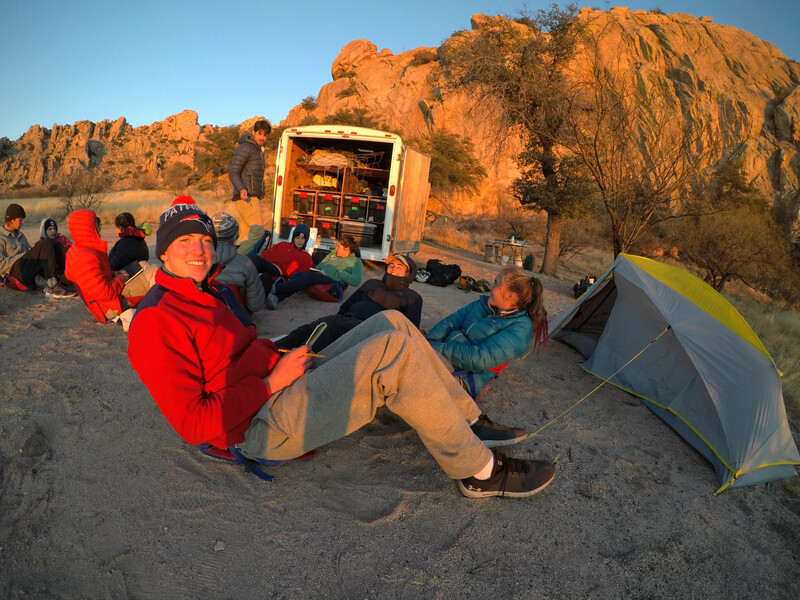 On our first day of Adjunct weekend, the group departed from Cochise Stronghold after getting a few last climbs in during the morning and set off to Tucson. We set up camp at a new campground and met up with Chris Farrell, who would be taking Kate and Quinn’s place as an instructor along with Patty for the weekend. After enjoying one night with all four instructors, we said our good-byes to Kate and Quinn for the next couple of days. They were off to an enjoy a weekend to themselves, catching a much needed break from our quite rowdy group. The following morning, we woke up our minds and bodies by doing a strenuous yet beneficial dance stretching routine led by Marshall. We then had the privilege of spending most of the day in the city of Tucson, doing laundry, working on homework and final projects at a public library, and showering for the first time in about a week. At the rec center where we took showers, there was also a heated pool that many of us swam in and had a lot of fun doing so. On our second day of adjunct weekend, the group ventured to the Sonoran Desert Museum and Zoo, where everyone roamed around, observing the exhibits and amazing creatures that we otherwise would likely rarely or never see in the wild. After a couple on hours of roaming freely, we reconvened to watch a free-flight bird show. With hawks and falcons swooping and flying just feet above our heads, many of us were filled with amazement at the beauty and agility of these predatory birds. After the museum, the group headed to downtown Tucson, where Patty and Chris let us loose to explore the city for most of the afternoon. We all then went out to dinner at a pub that night, followed by desert at Dairy Queen. The final day of the weekend began with a delicious and elaborate breakfast of eggs, sausage, fruit, and scones prepared by Patty and Chris, and entailed a relaxed day of cleaning the bus and trailer and doing homework. We definitely made the most out of blowing out the bus and trailer, and had the most fun I have ever seen anybody have while cleaning. With music blasting from the bus speakers, each of us worked diligently and efficiently to make our living quarters spotless. Once we were finished, the rest of the day was dedicated to catching up on the work that most of us inevitably left until the last second to finish, and taking turns using loaner phones to contact the outside world. Most of us had the privilege of talking to our parents for the first time in nearly a month, along with other friends and family members. This was very refreshing, although at the same time sad since we knew it would be several more weeks until we can communicate with these people again. 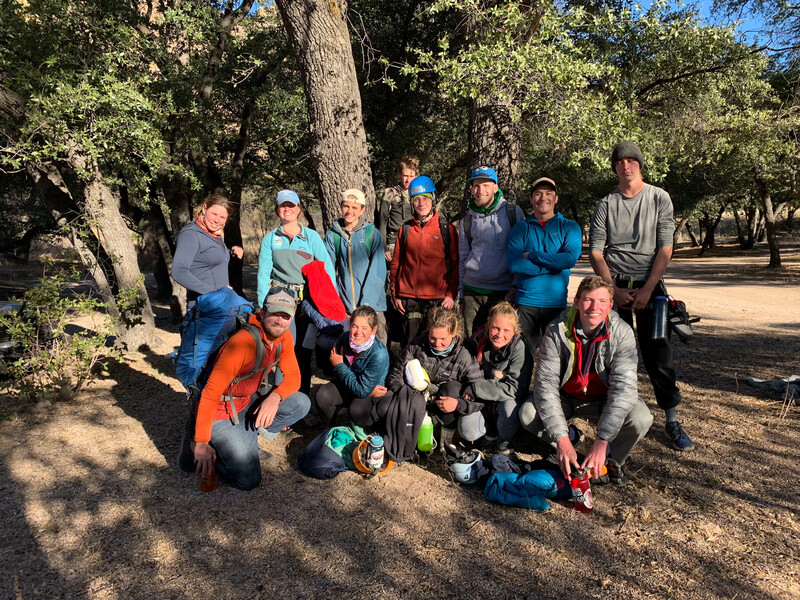 Upon awakening the next morning, Kate and Quinn had returned and reclaimed their places as the main Mountain Classroom instructors. The group had a wonderful time hanging out with Patty and Chris for a few days, but we were all incredibly excited to see ‘Mom and Dad’ again. 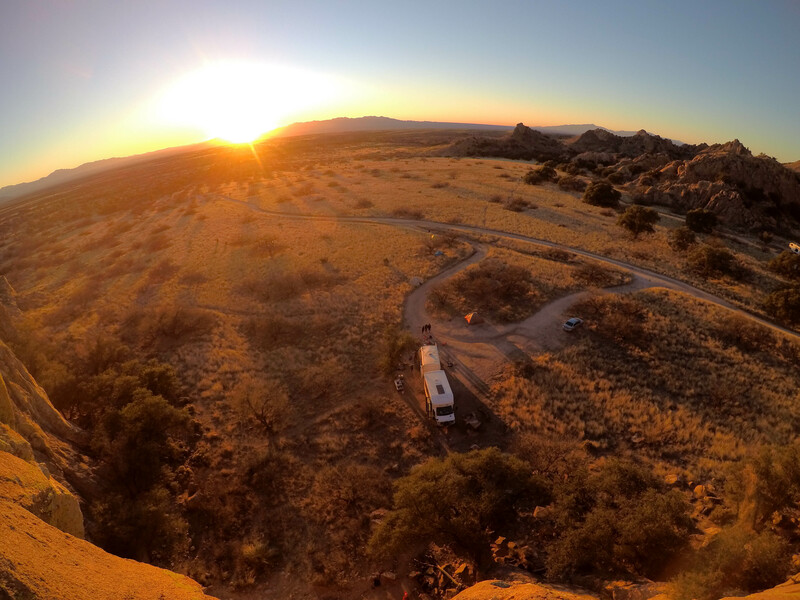 We briefly rejoiced in their arrival, and then set off toward new adventures awaiting us in Cascabel.